Two Norwegian brothers known as “Ylvis” who’ve been flying high with an international hit music video since last week landed abruptly on Thursday when the song behind the video was pulled off iTunes because of copyright concerns. They could still celebrate a breakthrough on the US Billboard chart, though, after nearly 20 million showings of the video on “YouTube” around the world. Bård and Vegard Ylvisåker, who grew up in Bergen, host the popular TV show I kveld med Ylvis (Tonight with Ylvis) on the commercial TV station TV Norge. 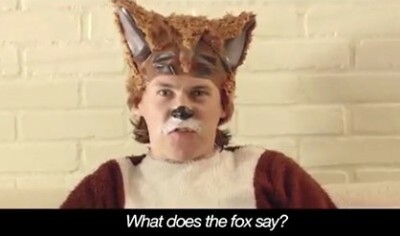 Their smash music video “The Fox,” which had notched up an astonishing 19.5 million views on YouTube by Thursday morning, was created as part of promotional efforts for their show’s new fall season. Instead the video has “gone viral” on YouTube and is being billed as “the next Gangnam-style.” It also has stormed the Billboard Hot 100 at an astonishing number 29, and become a huge Internet hit, especially in the US. But while everyone was expecting to see sales for the hit single rocket on American iTunes, it was suddenly taken down from both the Norwegian and American iTunes this week. “We’re working to get this situation cleared up as quickly as we can,” Guttorm Raa, head of Warner Music Norway, told website 730.no. The track has been removed because of copyright claims from a third party, according to the Norwegian pop and culture website. The song on the music video was produced by the Norwegian pop legend Stargate, a mega-successful Norwegian songwriting duo in New York who have produced hits for top Grammy-award winning artists. Bård Ylvisåker has said the brothers made a comedy video for one of the Stargate producer’s birthdays, and asked if Stargate could produce a song for them in turn, to promote their TV show. They were amazed when they agreed. “We thought, hey, we have this old idea about ‘what sound the fox makes, because nobody really knows.’ Instead of doing something intelligent like making a hit, we decided on that instead. But then it became a hit all the same,” Bård Ylvisåker said in an interview with the American music magazine Billboard. When the third season of “I kveld med Ylvis” premiered on Tuesday evening, meanwhile, the music video had already generated so much publicity that the show attracted more than half-a-million viewers at the start, quite a lot in a country with a population of just 5 million. The program began disastrously, though, with technical trouble that led to a black-out that lasted a full six minutes, according to newspaper Dagsavisen. When it finally came back on the air, the massive technical fault had done nothing to turn away viewers, some of whom actually thought it was all a comedy stunt from the brothers. In fact it set off another social media storm, with even more tuning in, and viewing figures topping 600,000. The brothers originally came from Sogn, but grew up in Bergen and Africa. They broke into the comedy business in 2000 with their theatre show Ylvis – A Cabaret in Bergen, which got rave reviews from the critics. A few years later they followed up with Ylvis – A Concert and both shows toured around Norway for several years. Tonight with Ylvis is the popular Norwegian late-night talk show the comedy duo now host, two hours a week on TV Norge. “It’s like a regular talk show, but in addition to having guests and comedy bits, we make three or four videos each season. They’ve done well, the biggest one has had 2.2 million I think. But nothing like this,” Bård Ylvisåker told Billboard. Offers are now rolling in from all over the world for tours, and record deals that most musicians in Norway could only dream of. Read the full Billboard interview and watch other Ylvis music videos here.